A skin care expert tells Cosmo what products and routines you really need--and what you can chuck off your regimen. Is your bathroom counter full of beauty products you don’t even use? And are you under the misconception that the more expensive the skin care product, the more effective and efficient it is? To address the second question, we hope you already know by now that price is not necessarily the best gauge for a skin care product's ability to deliver its promised results. You ideally should know that not all products that work for you are exactly the most expensive ones--and that some of the expensive pots you bought on impulse are now gathering dust on your bathroom counter since they did not really work as well as you expected. Purchasing a skin care product should be a more intelligent choice than just because of pretty packaging, rave reviews, or fads. To help you make an informed choice each time you pick up a product, we talked to derma clinic Skin Station and Godiva founder and president Fred Reyes, who debunked some common skin care myths that go with some of the products you think you might need--but, given your skin type or condition, not really. MYTH #1: You simply have to cleanse, tone, and moisturize! At the very least! BUSTED! In a tropical country such as the Philippines, those with oily skin can forego moisturizers because the weather won’t really dry your face and that extra step might cause your skin to produce excess oil, leading to acne and other skin problems. MYTH #2: You don't need to slather on sunscreen when it's cloudy. You only need to wear it on the beach. BUSTED! You should wear sunscreen everyday—regardless of whether you’re going to the beach, doing your groceries on a cloudy day, or even when you're staying inside the office. The sun is the primary cause of aging, and its damaging UV rays can penetrate those dark clouds you think serve as cover and even through glass windows. Without daily application of sunscreen on your face and body everyday, you will start suffering the damaging effects on your skin as soon as you hit 30. MYTH #3: "I use facial masks regularly because my friends tell me it’s a vital part of the skin care ritual." BUSTED! Facial masks (the kind you apply on your face, leave to dry for 15 minutes, and then wash off) are infused with a variety of ingredients (such as collagen, anti-aging chemicals, vitamin C, etc.). The effects of these ingredients are may be better achieved in other ways. However, don't be too quick to throw out your facial masks. Reyes says that masks can still be a good and affordable way to pamper yourself after a long day. MYTH #4: "I’m only 24, with no visible facial lines yet, but I already use anti-aging creams because I want to keep signs of aging from appearing on my face." BUSTED! Reyes told us the signs of aging really start appearing in your early 30s, when your body experiences a slowing down in cell metabolism. The two signs of aging he's talking about are loss of collagen and appearance of age spots. Before you purchase a particular anti-aging cream, know what you really need. Creams that increase collagen production are among your best bets, while the only prevention for age spots, which are caused by cumulative sun exposure, is really just sunscreen! Be religious about your sunscreen application, and you won't really need any other anti-aging cream for a much longer time. For more pressing skin care concerns, visit an expert. 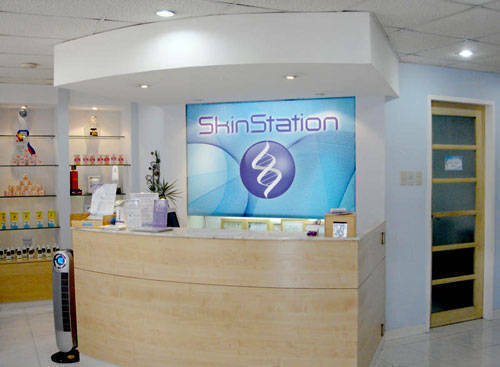 Check out Skin Station clinics at SM Fairview Annex; Robinsons Place Manila; the Ground Floor of Executive Building Centre, Sen. Gil. Puyat Avenue, corner Makati Avenue; the Second Floor of Metrobank Building, Timog Avenue, corner Scout Torillo Street, Quezon City; and the Ground Floor of Tao Corporate Center 2291 Pasong Tamo Extension, Makati City (across Toyota). Launch the gallery to see the Skin Station clinic and learn some more useful information about taking care of your skin! I don’t need to slather on sunscreen everyday like I’m going to the beach, do I? Sunscreen should be worn everyday—regardless of whether you’re going to the beach, doing your groceries, or staying in the office. The sun is the primary cause of aging. And if you don’t apply sunscreen on your face everyday, you will start suffering the side effects as soon as you hit 30.